The distance performance of VDSL2 is the thing that is most often used to criticise the Openreach roll-outs and lack of performance in rural areas in particular, but the reality is that while there is a gap so long as the who will and who won't benefit is communicated well it should not cause many problems i.e. expectation management. A report to the Scottish Borders Council's executive committee which is assume was delivered recently has been reported on by the BBC, and states that by September 2017, 82.7% of premises in the Borders were connected to fibre enabled cabinets and that this is set to rise to 94.9% by the end of this year (2018). A small change to the statistics is that with so many areas quoting fibre based figures, so that people don't have to hover a mouse on the graph we have added an entry showing coverage levels for fibre based services with all the distance calculations removed. 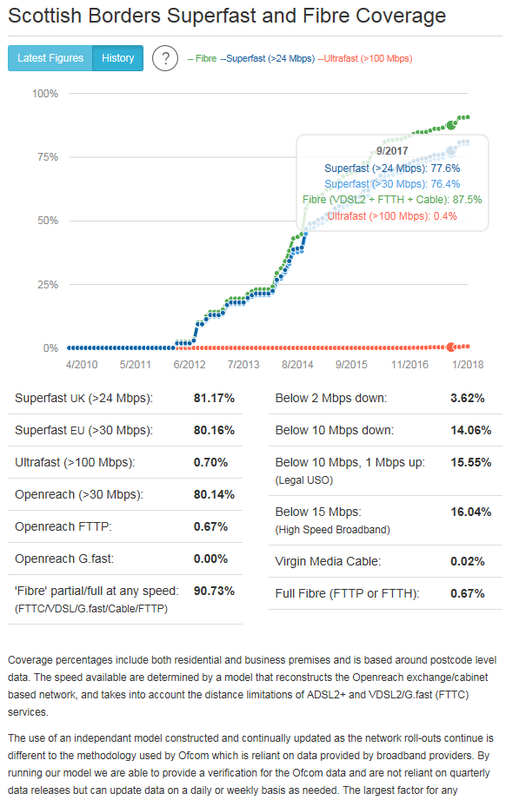 Our data for the end of September puts the basic fibre passed figure for council area at 87.5%, but once you start to take into account the distance limitations of VDSL2 this drops to 76.4% with option to access a 30 Mbps or faster connection, the 11.1% gap represents some 6,327 premises and some 680 premises are expected to get speeds in the over 24 but under 30 Mbps. The difference between the council report and our data maybe that as with the overall Digital Scotland project, which in the case of Scottish Borders if we apply a 15 Mbps threshold we arrive at 81.5% for the end of September 2017, with a 10 Mbps threshold the figure is 83.7%. 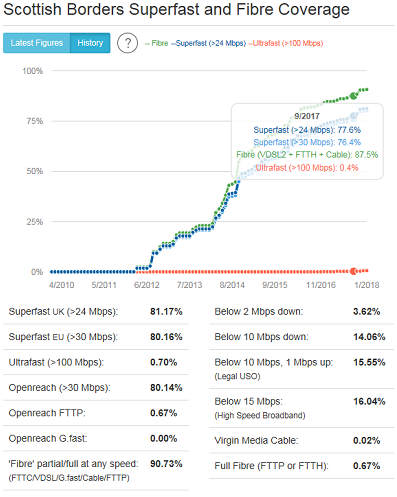 Moving forward to January 2018 at the start of the month, the gap between fibre passed and superfast had not really closed a lot, with fibre coverage at 90.7% but superfast at 80.2%. January when its dark,wet and cold outside is traditionally our tally up month on all our data, so our latest figures have not being pushed out just yet, but as we reach the end of January we are looking at a fibre based figure of 91.1% and superfast 81.5% for the Scottish Borders. As projects run for longer it is not unusual to see the fibre gap close down as extra infill cabinets are positioned generally 1 to 1.5km from an existing one to provide extra premises with access to superfast broadband. The Scottish Borders does have some full fibre, but at 0.67% it is not a large proportion but is likely to be growing due to the activity around new build premises, but with no distance restrictions full fibre does offer the technical solution, but the problem is the time it takes to deploy rather than any technical obstacles, and the extra time means when employing people that the cost is higher. The challenge is around balancing the amount spent to get superfast services to people, the time it takes and what upgrade paths exist and how soon may these need further public money if at all.